Derwent Academy pencils are made with natural wood barrels, quality pigments or graphite to give you the ideal introductions to the world of drawing. They are easy to sharpen and break resistant. Graphite pencils are graded with a number and/or letter usually referred to as degrees. The ‘B’ stands for Black and the ‘H’ stands for Hard. The ‘B’ Degrees are soft and best suited to sketching and blending. The harder pencils are used for straight lines and detailed work. These colour pencils blend together easily and transfer colour to the paper quickly and evenly. Watercolour Pencils are highly versatile, they can be used dry as a colour pencil or brush on a little water and they blend and dissolve easily to create a watercolour painting. Set includes a plastic eraser, pencil sharpener and a paint brush. A5 Pad of watercolour paper containing 5 sheets of paper (10 pages) and a project sheet with a series of useful techniques and a small project to complete for each pencil range. With the high quality pencils in the Derwent Academy Wooden Box, this colouring book is a perfect companion. Colours from the pencils lay down easily and subtle colour blending is easily achieved. 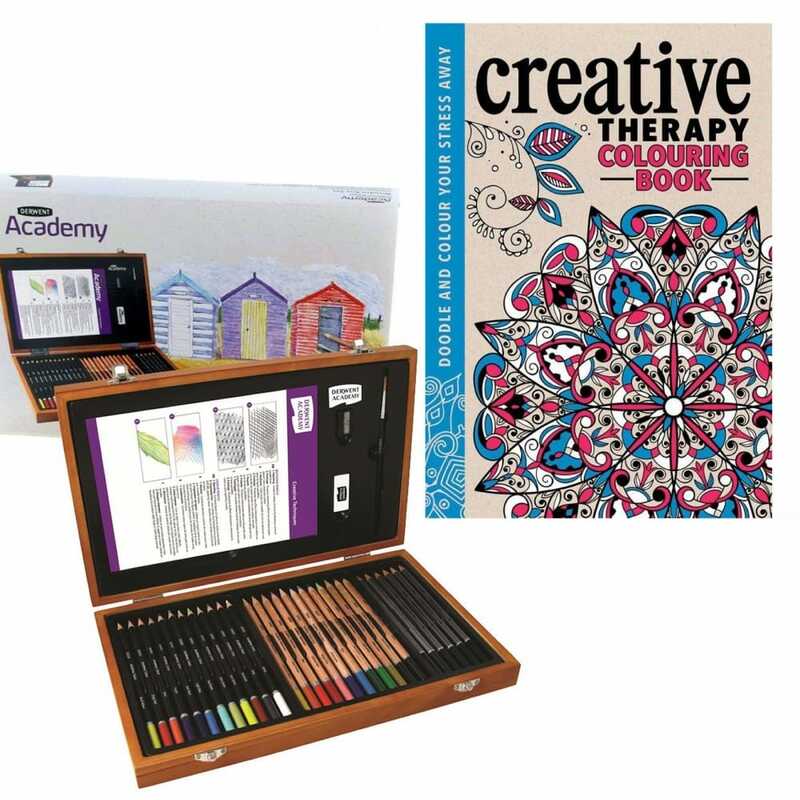 Unleash your creative spirit with this sophisticated anti-stress colouring, doodling and drawing book. The flowing lines, sweeping swirls and highly-detailed patterns on every illustration have been created so that anyone and everyone can enjoy making something beautiful and calming.